Geez, Dana—way to toss me a softball! Solve an artistic conundrum? My pleasure! Just let me finish convincing Mahmoud Abbas and Benjamin Netanyahu to fist-bump, and put down this Rubik’s Cube. We need more stories about everyone, just like Wikipedia needs more entries about minority and female figures. At least Wikipedia critics can fix the system for free—and bless the ones who do. We movie lovers have to pen hectoring wish lists that we hope the studios might hear out. I just wrote one of those, and half of my New Year’s resolutions for Hollywood boil down to diversity: We need a range of faces behind desks, behind cameras, and (as Chris Rock suggests) even behind sound-mixing boards. I’m the only one in this year’s Movie Club who lives here in Hollywood—why do you guys hate warm weather and fresh vegetables? !—and at every level, it’s very much a white, male, friend-of-a-friend business. I’m not trying to bash white males. Some of my favorite movies were directed by white males! (Er, how could they not be?) Sure, I want to see more movies like Amma Asante’s mixed-race period piece Belle. But I also I wonder if the true test of diversity would be the inverse: say, when Ava DuVernay gets hired to direct Taken 4. Of course, why would she want to? The problem is money. It always is. Let me tell you the movies that most excited me in 2014: Ouija, Annabelle, The Purge: Anarchy. And now let me tell you why before you think I’m nuts. Each of those films was made by a major studio for less than $10 million. And each of those made their money back tenfold. Those are all genre films, and genres (like horror) do have built-in audiences. But raise the ceiling to $20 million and you get profitable and diverse hits like Neighbors, The Fault in Our Stars, and Heaven Is for Real—all of which crossed the $100 million mark. Big flicks are lucky to double their money. Neighbors made back its investment 15 times over. My hope for 2015 is that studios see the dollars in smaller, less risky films and then use that formula to experiment and make films in more genres for more audiences. Because that smart, curious, hungry audience is out there. Steven Spielberg predicted that the era of expensive blockbusters is going to implode, and dios mio do I hope so. Unlike some, I’ve never been a sycophant for the so-called golden age of ’70s cinema Spielberg sprang from and scrambled, but boy do I want to go back to that world where Rain Man is the No. 1 hit of the year—or hell, even one where My Big Fat Greek Wedding cracks the top five. Speaking of cracks, that soapbox I leapt onto just splintered apart under my feet. Too many Christmas cookies. Time to step off. So, Boyhood! Yeah, as Dana points out, I wasn’t a fan. Yes, I respect Boyhood to death—what a feat, not just by Richard Linklater, but by everyone in the cast who kept coming back year after year, especially his daughter Lorelai Linklater, who by the end was clearly only bothering on behalf of her dear old Dad and yet was my favorite part of the movie. You guys have cornered me into saying something I haven’t wanted to say, mainly because I feel awful saying it: I just didn’t think Ellar Coltrane was that compelling. And it’s so so so not his fault! He didn’t ask to be an actor! (And he doesn’t seem to be trying to become one now.) 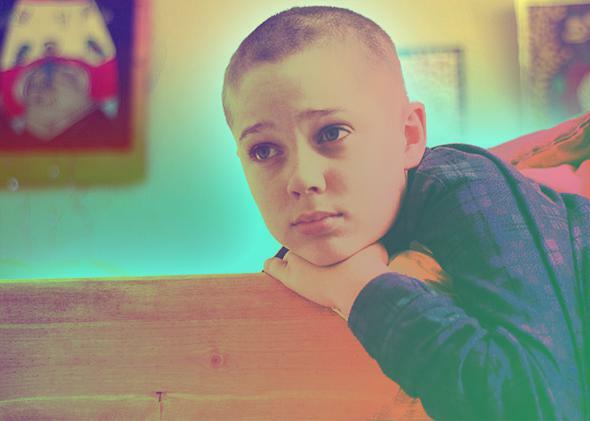 He’s just a very normal, sweet kid, which is why I spent the movie trying to look over his shoulder at all of the fun weirdos like Patricia Arquette and Ethan Hawke and Mlle Linklater, who was born with outrageous charisma. I liked the earlier years of Boyhood when it felt like an ensemble picture, though the parents, too, got less interesting thanks to the film’s message that eventually we all become square and middle-class. But as the focus narrowed on Mason, I completely lost interest. That ending with that sunset felt like unearned, banal triumph—congrats, kiddo, looks like you’ve got a reason to put a sock on your dorm-room doorknob. I wrestled with a similar feeling this week on my podcast The Canon, on which critic Devin Faraci and I debated the all-time greatness of The 400 Blows. (François Truffaut’s 20-year Antoine Doinel pentalogy was clearly Linklater’s inspiration, no?) Sure, The 400 Blows belongs in the canon of the most important films of all time—Boyhood might, too—but watching both films, I felt exhausted in the exact same way. Why must I always care about a boy’s coming-of-age story, when there are so few movies similarly tracking and mythologizing the growth of a girl? At least this year, we had the coming of age of three girls in We Are the Best! Who cares that it was directed by a dude with stubble? Which, despite my efforts to break away from making this year’s Movie Club a very special seminar on gender and politics, brings us full circle. David, for the love of God, let’s talk about our favorite movie farts of the year. I’ll start: the windows-rolled-up road-trip torture scene in Dumb and Dumber To! Rob Riggle was so great in that movie. I’m curious to hear who you think are the next great comedy stars of tomorrow, and I promise I’ll forgive you if they’re all white men. You’re a white man, and I think you’re wonderful. P.S. : Squeezing in that I adored Beyond the Lights, too—and saw it because Stephanie convinced me to on our own podcast. If only she could call everyone in America on Skype.